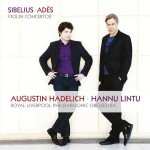 Augustin Hadelich’s first major concerto recording paired the Violin Concertos of Sibelius and Thomas Adès (AV 2276). Universally acclaimed, it was nominated for a Gramophone Award, was one of The New York Times’ Top Classical Albums of the Year, and was chosen by National Public Radio as one of the broadcaster’s 50 Favorite Albums of 2014, a list that included all genres of music. 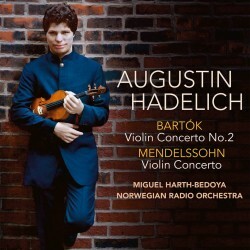 Augustin follows up with another provocative pairing, the ever-popular and melodious Mendelssohn with Bartók’s iconic Second Violin Concerto. Augustin revels in the concertos’ contrasts, as well as the similarities that emerge when the works are played together. Augustin’s penchant for programming has quickly caught on; as BBC Radio 3’s CD Review noted of the Adès-Sibelius coupling, “It all makes perfect sense in this performance of [Adès’] ‘Concentric Paths’ which in turn makes more sense of the performance of the Sibelius Concerto. It really does work as a double header.” Augustin’s latest, in which he’s superbly supported by his frequent collaborator Miguel Harth-Bedoya and the Norwegian Radio Orchestra, is sure to strike a significant chord as well.